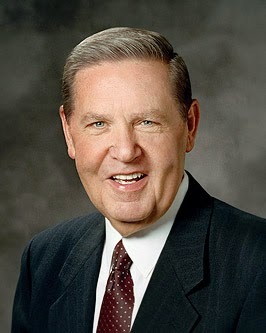 "Live the gospel as conspicuously as you can. Keep the covenants your children know you have made. Give priesthood blessings. And bear your testimony! Don't just assume your children will somehow get the drift of your beliefs on their own. The prophet Nephi said near the end of his life that they had written their record of Christ and preserved their convictions regarding His gospel in order 'to persuade our children... that our children may know... [and believe] the right way' (2 Ne. 25:23, 26, 28). 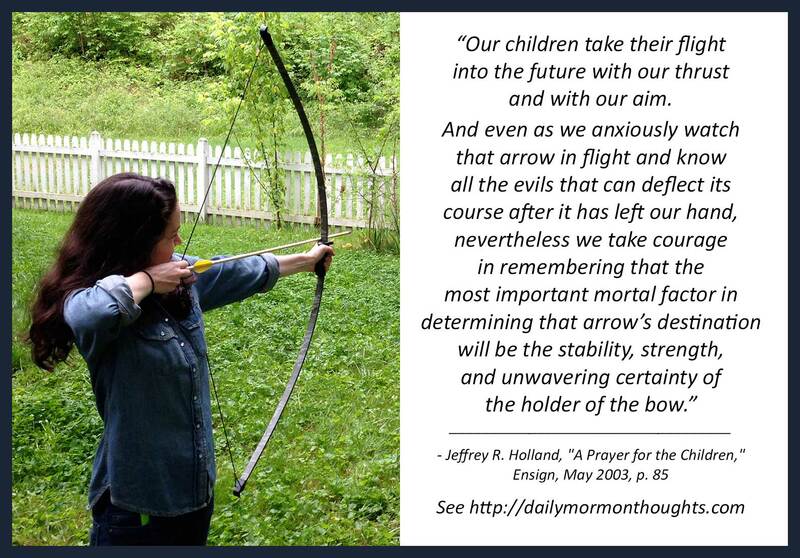 "Nephi-like, might we ask ourselves what our children know? From us? Personally? Do our children know that we love the scriptures? Do they see us reading them and marking them and clinging to them in daily life? Have our children ever unexpectedly opened a closed door and found us on our knees in prayer? Have they heard us not only pray with them but also pray for them out of nothing more than sheer parental love? Do our children know we believe in fasting as something more than an obligatory first-Sunday-of-the-month hardship? Do they know that we have fasted for them and for their future on days about which they knew nothing? Do they know we love being in the temple, not least because it provides a bond to them that neither death nor the legions of hell can break? Do they know we love and sustain local and general leaders, imperfect as they are, for their willingness to accept callings they did not seek in order to preserve a standard of righteousness they did not create? Do those children know that we love God with all our heart and that we long to see the face—and fall at the feet—of His Only Begotten Son? I pray that they know this. "Brothers and sisters, our children take their flight into the future with our thrust and with our aim. And even as we anxiously watch that arrow in flight and know all the evils that can deflect its course after it has left our hand, nevertheless we take courage in remembering that the most important mortal factor in determining that arrow's destination will be the stability, strength, and unwavering certainty of the holder of the bow." The counsel to live our religion "conspicuously" certainly applies directly to parents. But it could apply just as validly to the examples we set for those around us who are not family members, but friends and acquaintances in various settings.